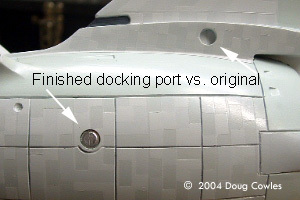 After looking for Millenia Models Enterprise photo-etched docking ports without sucess, I've devised a way to make my own. In my case, I used molded-in detail on one part of the model as a "master" for recreating that detail elsewhere. This general technique will work for similar situations. 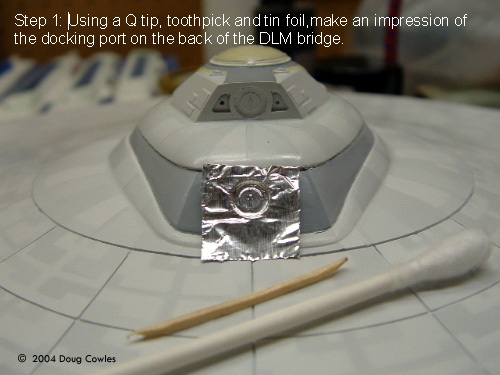 Step 1: Using a Q-tip (cotton bud), toothpick and aluminum foil, make an impression of the docking port on the back of the DLM bridge. 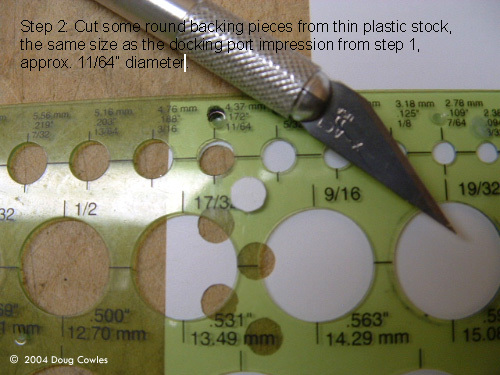 Step 2: Cut some round backing pieces from thin plastic stock, the same size as the docking port impression from step 1, approx. 11/64” diameter. Step 3: Super glue the 11/64” diameter backing piece from step 2 to the impression made in step 1. 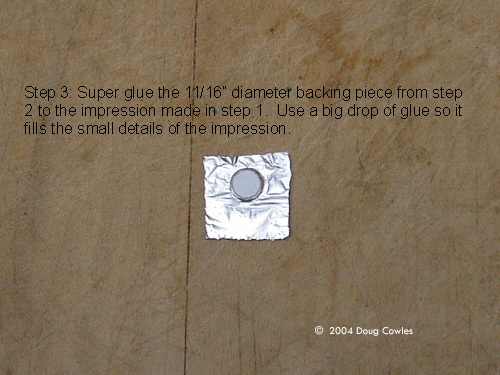 Use a big drop of glue so it fills the small details of the impression. 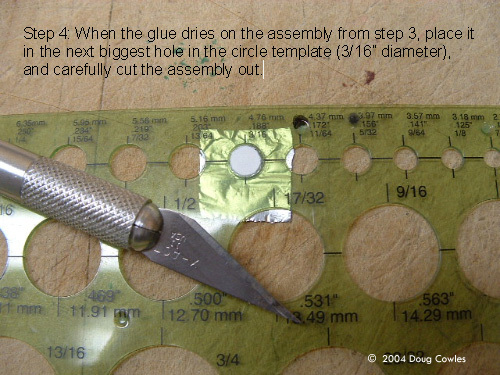 Step 4: When the glue dries from step 3, place it in the next biggest hole in circle template (3/16” diameter), and carefully cut the assembly out. 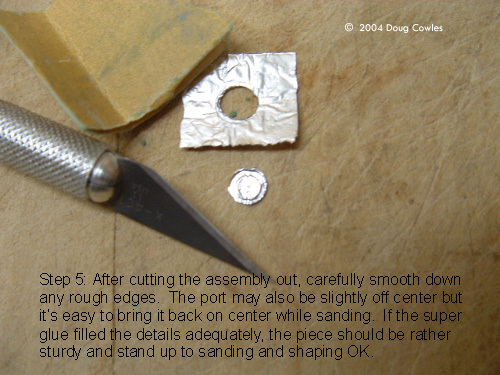 Step 5: After cutting the assembly out, carefully smooth down any rough edges. The port may also be slightly off center but it's easy to bring it back on center while sanding. If the super glue filled the details adequately, the piece should be rather sturdy and stand up to sanding and shaping OK. 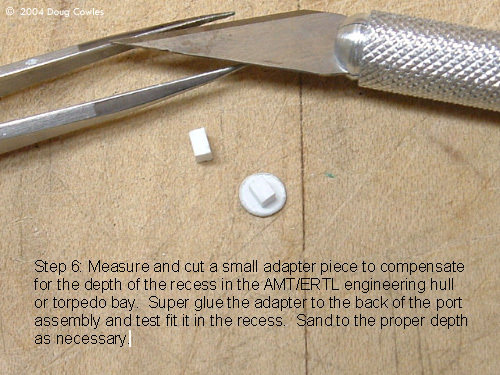 Step 6: Measure and cut a small adapter piece to compensate for the depth of the recess in the AMT/ERTL engineering hull of torpedo bay. Super glue the adapter to the back of the port assembly and test fit in the recess. Sand to the proper depth as necessary. This page copyright © 2004 Starship Modeler. First posted on 16 November 2004.